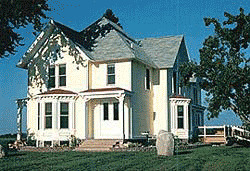 The Country Hermitage Bed and Breakfast is located just north of Traverse City, Michigan overlooking beautiful East Grand Traverse Bay. Discover the beauty and tranquility of this romantic bed and breakfast while you enjoy the gracious hospitality. The Innkeepers strive to help you have a relaxed and memorable experience. This local landmark was built in 1883 by one of Traverse City’s earliest pioneers as a promise to his wife. For a truly memorable Northern Michigan experience, visit the Bed and Breakfast that was built on a legacy of romance. Enjoy our cherry orchard setting with bay views – uniquely Grand Traverse! It’s important to us, that you enjoy your time here in Northern Michigan. We are happy to help our guests with meal reservations, tee times, or other adventures you wish to plan while staying at the Country Hermitage. Please check our area attractions page, to view informative area websites. Our B&B is closed each year from November through April. You can make reservations now for the 2015 season by going to our online reservation system at the top left of this page. Here are the latest photos of Country Hermitage Bed & Breakfast via instagram. If you have an instagram photo to share of your visit to Country Hermitage Bed & Breakfast, choose “Country Hermitage Bed and Breakfast” as your location and your photos will appear in the photo stream below.